In November 2004, the house of Mondavi collapsed. The wine world learned that the Robert Mondavi family, the first family of American wine, would no longer own their namesake wine company. Robert Mondavi Corp. had accepted a $1.3 billion bid from the global drinks giant Constellation Brands, dropping the curtain on what had been California's greatest wine saga. Many people knew of the financial perils Robert Mondavi Corp. faced in the preceding years and its repeated efforts to set its ship right. Despite an outward appearance of prosperity, unity, vision and strong leadership, the company had been in constant turmoil, emotional and fiscal. The company seemed to go from one crisis to the next, with barely enough time for the key characters to gather their wits. The family's bitter feuds were well-known inside and outside Napa Valley. Robert, the hard-driving family patriarch, perfectionist and wine icon, had been a difficult father, and his children felt distanced from him. He had pitted his two sons, Michael and Timothy, against each other on numerous occasions, even publicly criticizing them, and then forced them to fight for his approval against the backdrop of their shared desire to keep the winery in family hands. Few though knew of Robert's creeping financial woes. In the final months and years before his company's sale to Constellation, the seemingly wealthy genius who shaped the modern California wine industry suddenly faced the grim prospect of bankruptcy. He had earmarked much of his company stock for charity, and as RMC stock plummeted, so did his paper wealth. 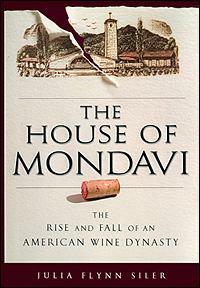 The House of Mondavi, The Rise and Fall of an American Wine Dynasty, (Gotham Books, $28) explores the Mondavis' bumpy journey in grand and fascinating detail. It follows a family of poor, hard-working Italian immigrants from the turn of the last century through their ascent to one of the best-known and widely respected wine companies of our times. The book's author, Julia Flynn Siler, a writer for the Wall Street Journal, tackles this complicated story from a business perspective. Certainly she has done her homework. The book is well-researched, with more than 250 interviews, including all of the important players, with an honest effort to represent the many different perspectives. It's fluid and well-written, with insight and rare details that weave together the family's frayed relationships and poor business decisions. What makes the Mondavi story, as told by Flynn Siler, both so compelling and fascinating is the drive and determination the family displays time and again when faced with adversity, even though much of it is self-imposed. Where it comes up short is bringing to life Robert in his prime: His charisma, enthusiasm and energetic drive to make great wines are lost in the pursuit of understanding the final denouement. What the book does explore in-depth is what many fine wine drinkers already knew. In the 1970s, Robert Mondavi Reserve was on everyone's top 10 list of Napa Cabernets. Today it is all but missing from most elite quality rankings. What happened? Along the way, the Mondavi winery's original reason for being, a commitment to quality wine, succumbed to a desire for profits above all. Robert's two sons, Michael and Timothy, helped him grow the winery, but later ran into trouble when handed the reins. Robert's winery was born of intra-family strife in the mid-1960s at the family-owned Charles Krug winery in St. Helena. The book recounts the famous fistfight between Robert and his younger brother, Peter, over the future of Krug winery; that incident culminated with Robert's ouster, at the hands of his mother, Rosa, and his starting anew in Oakville in 1966. There his oldest son, Michael, worked at his side, later joined by Timothy, the youngest of Robert's three children (daughter Marcia being the third). A decade later, a contentious public trial over compensation for Robert's years at Krug rekindled old animosities and further divided the family, with Robert getting much of the family's prized Napa Valley vineyard land. Robert Mondavi Winery opened a new era for Napa Valley, helping to put it on the world stage. The winery soon prospered and grew, but true to the capital-intensive wine business, was always starved for cash. One solution was to create a line of inexpensive wines made in the small town of Woodbridge, near the Central Valley city of Lodi. Eventually these wines became the financial engine of the entire company. Even then, according to Flynn Siler's account, the winery couldn't compensate for Robert's free-spending ways and lack of financial discipline, two themes that repeatedly haunted him and his company. Even as Mondavi's lower-priced Woodbridge wines grew in volume, profits were thin, forcing the company to seek revenues and growth elsewhere, mostly through winery acquisitions. The two lines of wines, the luxury line from Napa Valley and the inexpensive California one, cohabitated for years, allowing the Mondavis to pursue grander dreams and expand to a global empire. But the value of the Mondavi name on the label was slowly but steadily diluted. The book also tells of the joint project with the Rothschilds of France to create the luxury Napa Valley brand Opus One, a rich venture that ran into repeated cost overruns and price resistance. In the 1980s the company expanded again, adding smaller properties from California amid growing competition from wineries that had flooded the market with inexpensive varietals. By the end of the 1980s, the family faced not only a turbulent market, but also questions about the winery's future. Robert's solution: letting his sons share the CEO title, against the advice of others who suggested Robert seek a non-family member for that post. "Bob, you've got to think with your head, not with your heart," a close friend of Robert's advised him at one point, according to Siler. "These kids can't run the business," another friend explained to Robert. Still dogged by financial strains, the company chose to go public in 1993--a risky move. On one hand, it allowed the company and its investors, chief among them the Mondavis, to prosper when the stock sailed, and on paper they made millions. Yet they seemed to ignore the possibility of a worst-case scenario, a poor reaction from Wall Street to its profits. And that is exactly what happened. Soon after going public, the company stock sank, only to be temporarily rescued by the growth in sales of Mondavi's lower-priced wines. By the mid-1990s, Robert had decided that he would use much of his wealth for philanthropic pledges. He committed much of his stock to Copia (the Napa cultural center that he helped found) and the University of California at Davis, where he supported the wine education program and a performing arts center. His children were angered by that decision when they found out. They had worried that when Robert died they would be unable to pay taxes on his properties and capital gains. They had hoped their children would be the beneficiaries and be handed the company when they stepped down, extending the family's legacy to the next generation. A large portion of the book is devoted to the final troubled years, and no one looks good. Robert was aging. The company was struggling. Michael and Timothy couldn't reconcile differences. Then the family was told that they must reinvent the company again to revive profits; the board came up with a controversial plan to split the company in two, with one branch focusing on quality, the other on volume. Flynn Siler's research details how the Mondavis' unity collapsed. They feared that if the stock continued to plunge, Robert would be unable to meet his pledges. In the end, they signed away their super voting shares in exchange for a premium on their stock, and Constellation eventually made its successful bid. The book ends with the Mondavis on the outside and downside, rich yet bitter and bewildered by their downfall, angry and frustrated that they took the company public in the first place. Still, they bounce back. Robert, Timothy and Marcia have started a new winery, Continuum, continuing Robert's legacy, and Michael has started his own winery and importing and distribution firm. Timothy aims for quality, Michael for quality too, but also volume and profits. What they have learned from this remains to be seen. Are you reading the new book? Look for James Laube's upcoming blog on House of Mondavi and join the discussion.